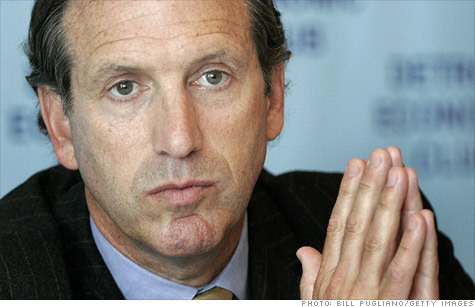 NEW YORK (CNNMoney) -- Starbucks CEO Howard Schultz is fed up with Washington. Spurred by what he describes as a failure of leadership on the part of lawmakers, Schultz is mounting a one-man bull rush against a political culture that has "chosen to put partisan and ideological purity over the well being of the people." What does that mean? No more political donations -- not for anybody. And he's recruiting other CEOs to join him. "I am asking that all of us forgo political contributions until the Congress and the President return to Washington and deliver a fiscally, disciplined long term debt and deficit plan to the American people," Schultz wrote in a letter that was passed on to members of the NYSE and Nasdaq. "All it seems people are interested in is re-election," Schultz told CNNMoney on Tuesday. "And that re-election -- the lifeblood of it is fundraising." Schultz said his breaking point was the contentious debate over raising the debt ceiling -- and the failure to reach a long-term solution to lower deficits. 0:00 / 5:18 Schultz to CEOs: No more campaign money! "[Lawmakers] have stirred up fears about our economic prospects without doing anything to truly address those fears," Schultz wrote to his fellow CEOs. Schultz's own political donations, as chronicled by the nonpartisan Center for Responsive Politics, skew heavily Democratic. Out of a total $183,650 in donations, only $1,000 went to Republican candidates. He said politicians can still make it right by coming together and reaching a compromise deal that would lift the cloud of uncertainty that has hamstrung the economy. "It means reaching a deal on debt, revenue, and spending long before the deadline arrives this fall," the letter said. "It means considering all options, from entitlement programs to taxes." His letters, and an interview with the New York Times on the subject, are already having an impact. The Starbucks (SBUX, Fortune 500) CEO said that in the 30 hours since the letters went out, he has heard back from thousands of Americans -- both CEOs and everyday citizens. Not one lawmaker has contacted him so far. "I suspect in the coming days, people who will be signing the pledge with me will be both Republican and Democrat CEOs who have had enough," he told CNNMoney. The amount of money spent to influence elections has been steadily climbing. In 2010 -- a year that did not include a presidential election -- $3.6 billion was spent. Of course, 2012 has the potential to break all records. It's unclear exactly how much of an impact -- if any -- Schultz's pledge might have. But a relatively small number of Americans do wield an outsized influence when it comes to political donations. Only 0.04% of Americans give in excess of $200 to candidates, parties or political action committees -- and those donations account for 64.8% of all contributions. Should Obama extend payroll tax holiday and jobless benefits?